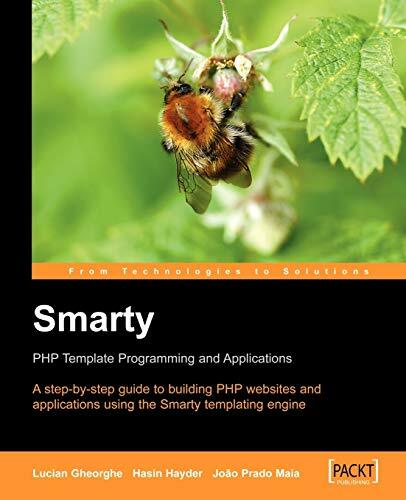 Smarty is a templating engine for PHP. Designers who are used to working with HTML files can work with Smarty templates, which are HTML files with simple tags while programmers work with the underlying PHP code. The Smarty engine brings the code and templates together. The result of all this is that designers can concentrate on designing, programmers can concentrate on programming, and they don't need to get in each others way so much. Even if you are developing a site on your own, Smarty is a powerful way to make your code clearer to you and others, as well as easier to debug and modify later. Hasin Hayder graduated in Civil Engineering from the Rajshahi University of Engineering and Technology (RUET) in Bangladesh. He is a Zend-certified Engineer and expert in developing localized applications. He is currently working as a Technical Director in Trippert Labs and managing the local branch in Bangladesh. Beside his full time job, Hasin writes his blog at http://hasin.wordpress.com, writes article in different websites and maintains his open source framework Orchid at http://orchid.phpxperts.net. Hasin lives in Bangladesh with his wife Ayesha and his son, Afif. Jo¿o Prado Maia is Lead Software Developer with Alert Logic, Inc. and was previously with MySQL AB as the lead developer behind Eventum, an issue tracking system, and MySQL Network, a subscription product for everything related to MySQL services. He has been working with PHP, Smarty, and PEAR for several years, and maintains phpbrasil.com, one of the most popular PHP-related community sites in Brazil. He is also interested in fostering a community of PHP developers in Houston by organizing the Houston PHP Users Group at http://www.houstonphp.org. Lucian Gheorghe has just joined the Global NOC of Interoute, Europe's largest voice and data network provider. Before Interoute, he was working as a senior network engineer for Globtel Internet, a significant Internet and Telephony Services Provider to the Romanian market He has been working with Linux for more than 8 years putting a strong accent on security for protecting vital data from hackers and ensuring good quality services for internet customers. Moving to VoIP services he had to focus even more on security as sensitive billing data is most often stored on servers with public IP addresses. He has been studying QoS implementations on Linux to build different types of services for IP customers and also to deliver good quality for them and for VoIP over the public internet. Lucian has also been programming with Perl, PHP and Smarty for over 5 years mostly developing in-house management interfaces for IP and VoIP services. + Why Use a Templating System? + What Does Concern Mean? + How to Design Table-less Layouts? + What is a Smarty Modifier?